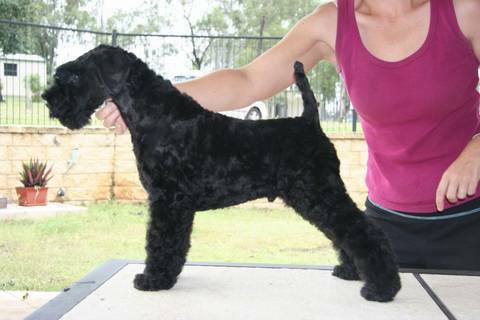 Olizure Hot Blu Dog - "Cooper"
We would like to Congratulate Cooper and Judith for becoming our First Olizure Kerry Blue Terrier Delta Dog Team. They have shown me what is possible when you have a lot of commitment and patience, as well as a Great Kerry Blue such as Cooper. Cooper came to Judith as a 6 month old puppy as we had decided not to keep him. He just wasn't enjoying the showscene. Judith said she liked a challenge and a Kerry Blue was on top of her list. After many phone calls, we both decided that Cooper was the right "fur-kid" for her and her family. And now, as a 13 month old, Cooper has exceeded my expectations by achieving this great qualification and we look forward to seeing what else Judith has instore for this great boy. A Bit about being a Delta Dog. Becoming a Delta Dog requires the dog to pass a rigorous temperament and behaviour assessment. The dog must always react positivly in all situations. These situations include reactions to exuberant and clumsy petting, angry yelling, staggering and gesturing, being bumped from behind, held by a stranger, crowded and petted, all situations that are likely to be encountered at some time during a visit. At the same time the evaluators are asked to gauge the overall sociability of the team and to assess the level of trust and understanding between the dog and the volunteer. The assessments are rigorous and there is always some disappointment for owners whose dogs fail to ‘make it’. The Delta Pet Partners Program not only involves temperament testing volunteers’ pet dogs, but also training the volunteers to become Pet Partner teams. All of the teams are clearly identified - the volunteers wear attractive monogrammed polo shirts and their dogs wear stylish bandannas - and have a high community profile. Volunteers and their Delta dogs visit any institution where re-establishing contact with a companion animal enhances the quality of the patients’ and residents’ lives. The joy and therapeutic benefit of the visiting volunteers and their Delta dogs bring these people – from small children to frail elderly nursing home residents - really has to be seen to be fully appreciated. Pet Partners visit children’s and adult hospitals, mental health units, hospices, adult respite day care centres, rehabilitation units, hospices and community group homes, schools and nursing homes, our largest client group and are a valuable part of our society. We are so pleased that Cooper is now part of this program and we thank Judith for all her hard work in making this possible. What is next for Cooper?? That is the question. Cooper & Judith are now working for a Disability Organisation, concentrating on Pet Therapy. He is proving to be one amazing Kerry for this type of work, as he seems to know what each patient needs from him - whether just to sit at their feet or put a loving chin on the patients arm or lap in order for them to be able to give him a pat. Sometimes he is even allowed to be a bit more robust and go for a walk to let his personality shine through. For such a young Kerry, he seems to have wisdom beyond his years and we are so very proud of him. I would never had thought that he was capable of so much and it just thrills us that he is making a difference in people's lives. Cooper has even been able to encourage loving reactions out of patients which have never responded in this way before. Continue the good work and we enjoy hearing of Cooper's latest achievements and adventures. 2013 - Cooper still works as a Delta Dog, but unfortunately, not as often as he would like as life just gets in the way. He is enjoying being the great friend to Judith and her family that he has always been. 2014 - It is with a heavy heart that I have to make this update. 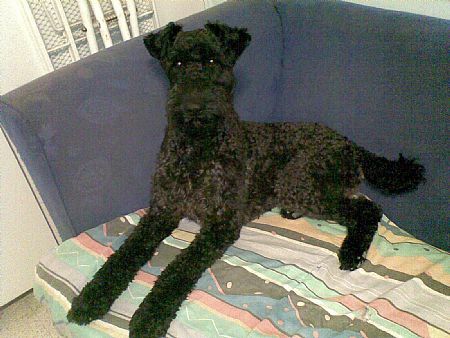 Cooper went to the Rainbow Bridge this year due to loosing his battle against tick paralysis. Unfortunately, even though he put up a big fight, there was little that Judith or his vet were able to do for him. He will be sadly missed by all that met him. Bye Cooper - run free and chase those pesky rabbits in the sky. This is a reminder to all owners to please know the early signs of tick paralysis and if in any doubt, take them to a vet asap. Even though you may not be able to see a tick, they are sneaky buggers, and can hide in the most obscure places which can evade the most vigilant owner, so not finding a tick does not mean it isn't there.